Cover: Rudy Nappi, a classic look again with Frank and Joe investigating in a dark place, but some nice color placement gives it punch. Love the bright yellow light through the crack in the floor. Setting: Bayport again! My, lots of crooks in this town. Where’s Fenton This Time? : Bayport again, but working on a case he can’t talk about and he comes and goes each day, so the boys are mostly on their own. Hey, wanna bet they are all working on the same case again? Aunt Gertrude’s Dessert: Generous portions of deep-dish apple pie. 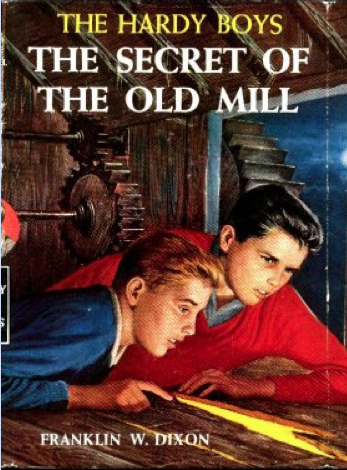 Plot: Someone is passing out counterfeit twenties, and meanwhile outside of town is this old mill that is being used by a company involved in top-secret missile research, and Fenton is trying to stop sabotage at said company. Review: Mixed. It seems to be a lot of show-up-at-mill, something happens. Rinse, repeat. And boy do the crooks blab a lot at the end, worse than a classic Bond villain! But there is nice detective work by the boys, Gertrude shows up, it’s exciting. 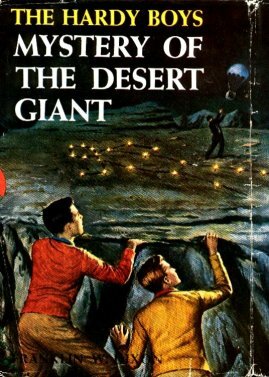 Decent early Hardy Boys.